Happy Monday Team Stryker fans! Hope you all had a great weekend. I’ve been very busy trying to get issue 4 finished for its be debut early next year. Right now I’m halfway done penciling the issue and think that it is going to be the best one yet. It is a lot more ambitious than anything I’ve ever done before but Team Stryker fans deserve the best and I want to bring that to you year after year. 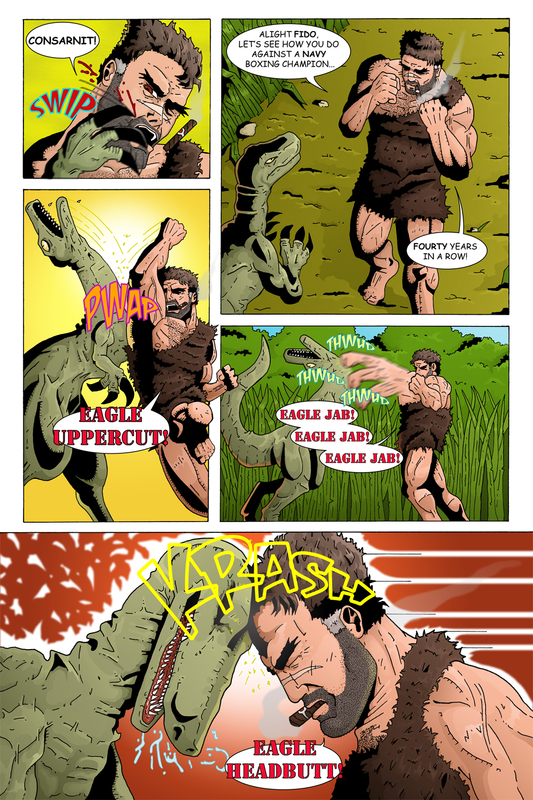 Today’s page is the final page in the battle with the raptors and I wanted to save Eagleheart for last. This was a fun page to plan out as I had to think how would a 200+ year old soldier fight a velociraptor? I thought about those old Bugs Bunny cartoons where they would have a man box with a kangaroo and then I made the leap to velociraptor. Some people have asked me why Eagleheart insists on putting “Eagle” in front of his attacks. Does he think he is in a game of Street Fighter or is he just senile? The answer is: a little of both. At 200+ years no matter how fast your eagle heart beats you are still going to lose a few marbles along the way. Have a great week and I will see you back in on Thursday for the next exciting page of Team Stryker!